Chris BottiChris Botti has become the largest- selling American instrumental artist since the release of his 2004 critically acclaimed CD When I Fall In Love. His success has crossed over to audiences usually reserved for pop music and his ongoing association with PBS has led to four #1 jazz albums, as well as multiple Gold, Platinum and Grammy Awards. Most recently, his latest album Impressions won the Grammy for Best Pop Instrumental Album at this year’s 55th Grammy Awards. On October 4, 2013, The New York Pops orchestra will launch its 31st Season at Carnegie Hall with An Evening with Chris Botti. Music Director and Conductor Steven Reineke will lead the orchestra in a highly-anticipated opening with America’s largest-selling instrumental artist, trumpeter Chris Botti. The performance will include selections such as Chopin’s "Prelude in C Minor," "Emmanuel," and "When I Fall in Love" from his recent Grammy Award-winning album Impressions, as well as other popular favorites, at Carnegie Hall’s Stern Auditorium/Perelman Stage. Click here for tickets! 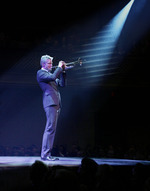 For more on Chris be sure to visit http://www.chrisbotti.com and follow him on Facebook and Twitter! Chris Botti1. Who or what inspired you to become a instrumental artist/trumpeter? My mom is responsible for exposing me to and got me in to music at an early age. Being a piano player, my mom first got me into piano but as many kids do, I rebelled against it and wanted to do something different. That’s when I saw Doc Severinsen on television and thought the trumpet would be cool. I picked one up and then a few years later when I was twelve years old I heard the first three notes of Miles Davis’ "My Funny Valentine" and at that moment, I knew I wanted to be a jazz musician. 2. Who haven't you worked with that you would like to? I’ve always wanted to work with Peter Gabriel. 3. You are going to be The New York Pops special guest on October 4 as part of their evening dedicated to you. What excites you most about this upcoming evening? This is my first true orchestra show in the New York area so that makes this very, very special. I’ve had the opportunity to play Carnegie Hall a few times and of course everyone feels the same when they walk out on that very famous stage…it’s really an honor to be there. 4. What does it mean to you to have The New York Pops dedicate an evening to you and your music? I’m deeply honored to have the evening dedicated to me. I think it’s something you dream about as a kid when you’re practicing the trumpet for so many hours and truly, it’s a dream come true. 5. What excites you most about performing at Carnegie Hall? The very first time I played Carnegie Hall, I was in high school with the McDonalds All American High School band. Back then I never thought I’d be playing there with the New York Pops as a headliner and honestly, I still get a major dose of butterflies when I walk on stage at Carnegie Hall. It’s just a really special experience. New York Pops Conductor/Music Director Steven Reineke conducting The New York Pops, Photo Credit: Richard Termine New York Pops Conductor/Music Director Steven Reineke, Photo Credit: Michael Tammaro6. What are looking forward to about performing with New York Pops Musical Director/Conductor Steven Reineke? He’s truly one of my favorite conductors to work with. He has that rare gift of being able to understand the jazz group and how we feel time and tempo and are loose. At the same time, he takes the structure of classical music and molds the two styles together to fit perfectly. 7. What do you hope audiences come away with after attending this concert? Like any of our shows, I hope that they’re moved emotionally and I hope they have a great time. I know that’s an overused cliché sometimes but if you can get those two things to happen, whether they cry or laugh or feel some extra emotion and then they leave the night saying "Wow I never thought I’d see musicians like that," then the whole night fits together for a really entertaining experience. 8. As an artist who travels around the world, what do you enjoy most about this part of your work and what challenges does it present for you? Well certainly coming to NY isn’t really a challenge since it’s like coming home in so many ways. However, the challenges you get traveling around the world 300 days a year are far outweighed by the rush or the energy that you get from an audience and being able to walk out and perform for them. I think if you were able to look back at your life and say this is why I practice music, it makes all those challenges like going through security at airports go away quickly. Chris Botti, Photo Credit: LeAnn Mueller9. How have you stayed grounded in an industry that has led others down a darker road? I think the trumpet is a great solidifying instrument. In other words, you have to practice it everyday and you can’t take a vacation from it. Having a very workman’s attitude towards music, I mean there’s music and then there’s playing the trumpet, and having to do it everyday keeps me a bit more grounded. 10. What have you learned about yourself from your illustrious career? It takes a long time and the higher up the mountain you climb the more you realize that you haven’t achieved the musical satisfaction you’re looking for because you’re always trying to reach the next goal. Coming back to having a workman’s attitude, developing a routine and feeling good about going city to city to play music, I’ve learned to try and not put too much pressure on myself as an artist. For me, I feel grateful to have the band I have and the musicians we travel around with and I try not to look at the top of the mountain…or at least hopefully not the bottom. 11. What's the best advice you've ever received? Again it’s a cliché, but we’re playing Carnegie Hall and how do you get to Carnegie Hall? You have to practice and have behind it the intent to sacrifice a lot. People say, "I would practice" or "I did last week," but you have to put years and years and years of practice in and keep having that satisfaction given to you by the instrument. Practice and not to veer off too much is probably the best advise I gave myself and I keep seeing it in other people I recognize to be very talented. People like Sting have that very driven, focused, workman’s like attitude built around the fundamentals of music rather than the pop culture aspect of it. 12. If you could have any super power, which one would you choose? Is there a super power for more sleep? Performing worldwide and selling more than three million albums, he has found a form of creative expression that begins in jazz and expands beyond the limits of any single genre. Over the past three decades, Botti has recorded and performed with the best in music, including Sting, Barbra Streisand, Josh Groban, Yo-Yo Ma, Michael Bublé, Paul Simon, Joni Mitchell, John Mayer, Andrea Bocelli, Joshua Bell, Aerosmith's Steven Tyler and even Frank Sinatra. Hitting the road for as many as 300 days per year, the trumpeter has also performed with many of the finest symphonies and at some of the world's most prestigious venues from Carnegie Hall and the Hollywood Bowl to the Sydney Opera House and the Real Teatro di San Carlo in Italy. Impressions, Botti's 2012 Columbia Records and Grammy Award-winning release, is the latest in a stellar parade of albums – including When I Fall In Love (2004), To Love Again: The Duets (2005),Italia (2007), and the CD/DVD Chris Botti in Boston (2009) – that has firmly established him as a clarion voice in the American contemporary music scene. Playing with his uniquely expressive sound and soaring musical imagination, Botti is joined on the disc by featured artists Andrea Bocelli, Vince Gill, Herbie Hancock, Mark Knopfler, and David Foster in a warm, intimate celebration of melodic balladry. With Impressions and the albums that preceded it, Chris Botti has thoroughly established himself as one of the important, innovative figures of the contemporary music world. The New York Pops is the largest independent pops orchestra in the United States, and the only professional symphonic orchestra in New York City specializing in popular music. Led by Music Director Steven Reineke, the orchestra performs an annual subscription series and birthday gala at Carnegie Hall. The New York Pops was founded by Skitch Henderson in 1983 with a mission to create greater public awareness and appreciation of America’s rich musical heritage. The New York Pops is dedicated to lifelong learning, and collaborates with public schools, community organizations, children’s hospitals and senior centers throughout the five boroughs of New York City. Pops Education allows thousands of New Yorkers of all ages and backgrounds to participate in fully customizable music programs that blend traditional education with pure fun. Steven Reineke, Photo Credit: Michael TammaroSteven Reineke is the Music Director of The New York Pops at Carnegie Hall, Principal Pops Conductor of the National Symphony Orchestra at the John F. Kennedy Center for the Performing Arts, and Principal Pops Conductor of the Toronto Symphony Orchestra. Mr. Reineke is a frequent guest conductor with The Philadelphia Orchestra and has been on the podium with the Boston Pops, The Cleveland Orchestra and the Chicago Symphony Orchestra at Ravinia. His extensive North American conducting appearances include San Francisco, Houston, Seattle, Edmonton and Pittsburgh. As the creator of more than one hundred orchestral arrangements for the Cincinnati Pops Orchestra, Mr. Reineke’s work has been performed worldwide, and can be heard on numerous Cincinnati Pops Orchestra recordings on the Telarc label. His symphonic works Celebration Fanfare, Legend of Sleepy Hollow and Casey at the Bat are performed frequently in North America. His numerous wind ensemble compositions are published by the C.L. Barnhouse Company and are performed by concert bands around the world. A native of Ohio, Mr. Reineke is a graduate of Miami University of Ohio, where he earned bachelor of music degrees with honors in both trumpet performance and music composition. He currently resides in New York City with his partner Eric Gabbard.